The Forecastle Festival has announced its initial lineup for their 10th annual event, to be held July 13-15 at Louisville’s Waterfront Park. Bassnectar and Wilco will be joined by My Morning Jacket as headliners, and the current lineup includes acts like Sleigh Bells, Girl Talk and Andrew Bird. Check out of a current lineup and ticketing details after the jump. Forthcoming details will include information on additional artists, as well as details regarding the festival’s art installations, sustainability activities, an outdoor extreme sports park and food options. Details are also forthcoming for those looking to hit up one of the festival’s separately ticketed late-night after parties, including those on the historic Belle of Louisville steamboat. Three-day weekend and VIP passes, as well as two and three-day travel packages are now available. Festival-goers who wish to “dock up” on the water can purchase a limited number of “Captain’s Club” VIP boat slips on the festival site. If a slip is too rich for your blood, consider paying off your ticket over time. 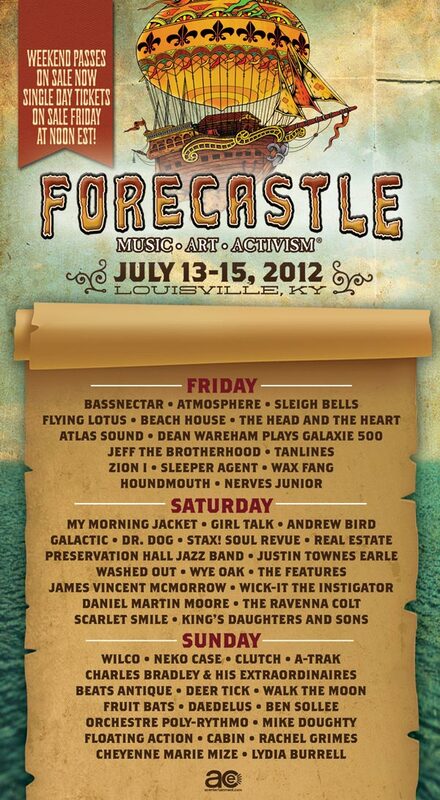 Forecastle is offering payment plans that will cover the price of a VIP three-day or weekend pass over four installments. Tickets are also available at select regional retailers, including WHY Louisville, Shake-It Records in Cincinnati, Indy CD and Vinyl in Indianapolis and Grimey’s New and Preloved Music in Nashville.